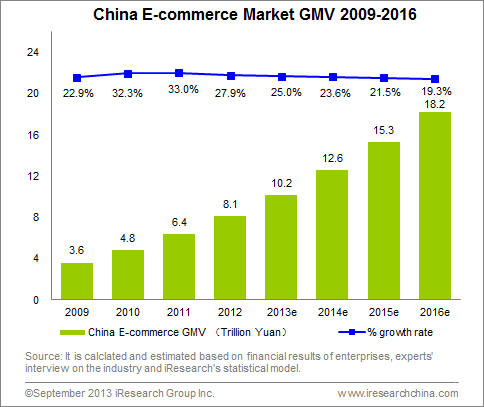 According to 2012-2013 China eCommerce Report released by iResearch, China eCommerce market kept high growth and its GMV hit 8.1 trillion Yuan in 2012. In China eCommerce market segments, online shopping experienced the highest growth of 66.1%. Small and medium-sized enterprises’ business to business (B2B) market decreased slightly by 26.5%. Online travel booking market increased by 30% and its penetration rose to 6.6%. According to 12th Five-Year Plan on eCommerce released by Ministry of industry and Information Technology of the People’s Republic of China in March 2012, China will actively develop eCommerce in the agriculture industry to advance the agriculture capital & products circulation system and to find new ways to make peasants rich. Furthermore, the government will strengthen supervision and guidance of eCommerce market. In December 2012, National Development and Reform Commission clearly claimed that on New Years’ Day of 2013 and in Spring Festival, the competent department of price should pay close attention to the sales promotion behavior of large business operators, investigate and punish the businessmen’s illegal behaviors, for example, price of products in promotions is higher than their original price. And they abide by their price commitments and hide the price clause. On December 20 2012, the first eCommerce regulation center was established in Beijing. In 2012, investors were conservative in China eCommerce market, but they took real interest in the market. The total investments and financing in eCommerce market reached 6.5 billion Yuan. Thirdly, eCommerce Operators Accelerated Revolution. In business to customer market, on the one hand, eCommerce operators accelerate the open of the platforms. On the other hand, they expand categories of products for obtain new market such as fresh food eCommerce market. In SMEs’ B2B market, eCommerce operators made innovation in profit-making model. Their revenue sources changed to be transaction commission from membership fee. In 2012, penetration of online shopping in shoppers grew to 45.5% from 40.5% of 2011. In 2012, GMV of online shopping market in USA reached 14.09 trillion and in China, it amounted to 13.03 trillion. iResearch estimated that online shopping GMV in China would surpass that of America in 2013.Generally speaking, China online shopping started later but developed faster compared with that of America. In 2003, online shopping GMV accounted for 1.8% of the total retail sales of consumer goods in USA while it was less 0.1% in China. However, after ten years of development, penetration of online shopping GMV in the total retail sales of consumer goods in China increased to 6.2%, completely exceeding USA. But penetration of online shoppers in PC Internet users in China lags far behind USA. In 2012, it was 45.5% in China and 71.6% in USA. China online shoppers concentrate in the first and second tier cities, and there is huge potential to explore in the third and fourth tier cities of China. Furthermore, compared with China, online shopping is more mature in logistics, especially has advantage in logistics infrastructure, reach area, and service management of logistics enterprises. Meanwhile, limited by existing express way and railway network, China has a long way to go in logistics infrastructure construction. iResearch views that logistics and payment are very important links in the online shopping chain. It’s very necessary to strengthen storage logistics building when online shopping market is expanding to small cities and towns in China. Firstly, eCommerce market will embrace more innovations and profit-making models. B2C eCommerce operators focus on expanding the categories of products and boost the open of the platforms. In 2012, JD.com, suning.com and dandang.com opened the platform and attracted merchants to prepare for eCommerce with products of full categories. In 2013, Vancl and Suning also made moves in open platform. In B2B market, Alibaba and DHgate firstly started pay-for-performance model. At the same time, HC360 and Mysteel also made more efforts on online transaction. In the future, SME business to business operators will gradually involve them into the transaction between merchants and buyers as well as provide financial guarantee service. Finally, B2B eCommerce cycle could be completed. Secondly, mobile shopping will keep hot. According to iResearch, China mobile shopping GMV reached 63.17 billion in 2012, accounting for 4.8% of the online shopping GMV. Seen from quarterly data on mobile shopping in 2013, China mobile shopping maintain high growth. It increased to 64.18 billion in the first half of 2013, sharing 8.1% of online shopping market. At present, mobile shopping is at the early stage of development. With the popularity of mobile internet and growth of internet speed, penetration of mobile shopping will further rise in the future. Thirdly, online to offline becomes the newest buzzword and eCommerce enterprises make strategy to seize favorable opportunity. Under the influence of eCommerce, traditional enterprises are changing their original attitude and seek for innovation. At the moment, online to offline is a better way for them to achieve goal. iResearch holds that two models of online to offline business are extending online shopper to offline shop and mixing price, supply chain and storage logistics together in online and offline sales. Either of models can integrate online advantage with offline resources, providing new choice for traditional enterprises and eCommerce operators. Suning and Yintai, representatives of traditional enterprises have tried online and offline.